frequent, often destructive, earthquake and volcanic activity. volcanoes in the Cascades--Mounts Baker, Hood, and Rainier--for British naval officers. 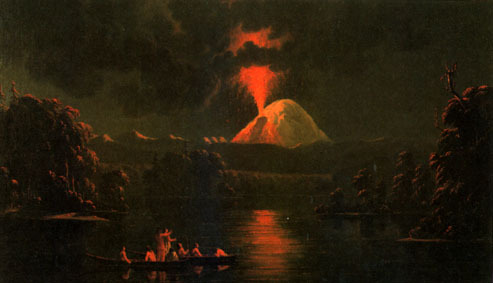 following a visit to the volcano in 1847 (Photograph courtesy of the Royal Ontario Museum). more than a century after 1857. Consequently, the majority of 20th-century residents and visitors thought of Mount St.
and wooded shores, was especially popular as a recreational area for hiking, camping, fishing, swimming and boating. dangerous--volcanoes of the United States are not restricted to Alaska and Hawaii. 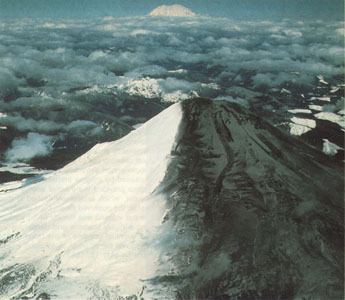 prehistoric eruptive behavior of Mount St. Helens. formation of the Goat Rocks lava dome by 1857. The post-A.D. 1400 segment of the 50,000-year eruptive history of Mount St. Helens (after USGS Bulletin 1383-C). formed during the past 2,200 years, well after the melting of the last of the Ice Age glaciers about 10,000 years ago. most accurate forecasts of a violent geologic event. activity of Mount St. Helens. 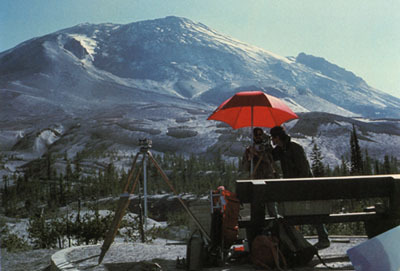 Mount Rainier is visible in background (Photograph by C. Dan Miller). by several much smaller earthquakes beginning as early as March 16, was the first substantial indication of Mount St.
earthquake-induced avalanches of snow and ice, but no sign of an eruption. With a thunderous explosion, or possibly two nearly simultaneous ones, widely heard in the region at about 12:36 p.m.
preexisting snow- and ice-filled summit crater, and new fractures broke across the summit area. nearly horizontal movement--about 85 feet in 20 days--of one of the measured points on the "bulge."